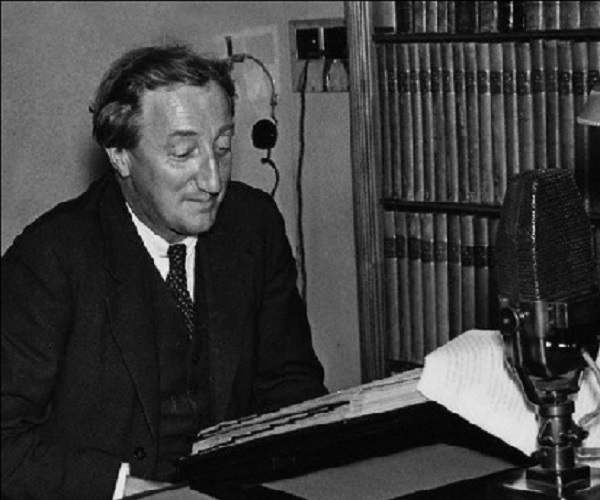 Today is the birthday (1890) of Sir Alan Patrick Herbert CH, usually known as A. P. Herbert, English humorist, novelist, playwright and law reform activist who served as an Independent Member of Parliament (MP) for Oxford University from the 1935 general election to the 1950 general election, when university constituencies were abolished. His most famous short stories, first published in Punch under the general title Misleading Cases, are fictitious law cases in which Herbert explores apparently absurd aspects of the law, and in which the protagonist, Albert Haddock, representing Herbert’s point of view, upholds his civil liberties by taking many to court, defending himself without counsel, and usually winning. Herbert himself said “Albert Haddock made his first public appearance, in Punch, in 1924. I have always understood that I invented him: but he has made some disturbing escapes into real life.” Over his lifetime Herbert published five collections: Misleading Cases in the Common Law, More Misleading Cases, Still More Misleading Cases, Codd’s Last Case, and Bardot M.P.?. Herbert was born in Ashtead in Surrey and attended New College, Oxford where he received a first in Schools in Jurisprudence in 1914. He joined the Royal Naval Volunteer Reserve as an ordinary seaman after the outbreak of World War I, later serving as an officer with the Royal Naval Division. 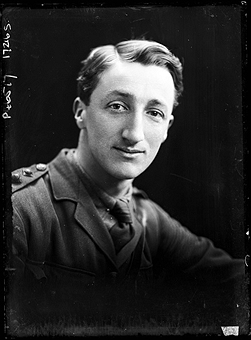 He fought in the Gallipoli campaign and on the Western Front, becoming his battalion’s adjutant in 1917, following which he was injured and did not return to the front line before the end of the war. Following the war, he published The Secret Battle and joined the permanent staff of Punch in 1924. He also wrote the librettos for several musicals. Herbert was elected as the Independent MP for Oxford University in the 1935 general election. Before the outbreak of World War II, Herbert campaigned for private member’s rights, piloted the Matrimonial Causes Act 1937 through Parliament, opposed the Entertainments Duty and campaigned against the Oxford Group. He enlisted in the River Emergency Service in 1938 and served in World War II as a Petty Officer in the Royal Naval Auxiliary Patrol. He captained the river boat, Water Gipsy, assigned to the River Thames. In 1943, he was part of a parliamentary commission sent to investigate the future of the Dominion of Newfoundland. Herbert loved the River Thames and lived beside the river in Hammersmith in West London. He was a Conservator (a member of the Thames Conservancy Board) and a Freeman of the Company of Watermen and Lightermen. In 1966 he wrote The Thames in which he explored numerous aspects of the river. Haddock tendered the cow in payment of his bill and demanded a receipt. Sir Joshua informed the court that the collector did try to endorse the cheque on its back, in this case on the abdomen. However, Sir Joshua explained: “the cow … appeared to resent endorsement and adopted a menacing posture.” The collector abandoned the attempt and declined to take the cheque. Haddock led the cow away and was arrested in Trafalgar Square for causing an obstruction, leading to the co-joined criminal case, R. v Haddock. He testified that he had tendered a cheque in payment of income tax. A cheque was only an order to a bank to pay money to the person in possession of the cheque or a person named on the cheque, and there was nothing in law to say it must be on paper of specified dimensions. A cheque, he argued, could be written on notepaper. He said he had “drawn cheques on the backs of menus, on napkins, on handkerchiefs, on the labels of wine bottles; all these cheques had been duly honored by his bank and passed through the Bankers’ Clearing House”. He thought that there was no distinction in law between a cheque on a napkin and a cheque on a cow. When asked as to motive, he said he did not have a piece of paper to hand. Horses and other animals used to be seen frequently in the streets of London. He admitted on cross-examination that he may have had in his mind an idea to ridicule the taxman. “But why not? There is no law against ridiculing the income tax.” In relation to the criminal prosecution, Haddock said it was a nice thing if in the heart of the commercial capital of the world a man could not convey a negotiable instrument down the street without being arrested. If a disturbance was caused by a crowd, the policeman should arrest the crowd, not him. The judge, sympathetic to Haddock, found in his favor on the tax claim, but in favor of the prosecution for causing a disturbance. 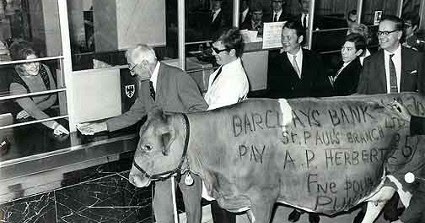 By tendering and being refused the cow, the Inland Revenue was estopped from demanding it later. Negotiable instruments and other legal documents have been written on unusual surfaces. Documented cases provide illustrations of wills on the side of empty egg-shells, and cheques being written on a variety of strange surfaces. An often-cited example is a Canadian farmer who, while trapped under his own tractor, carved a holographic will into the tractor’s fender. The fender was probated and stood as his will, and is currently on display at the law library of the University of Saskatchewan College of Law. In Jewish law a get can be written on any durable material, including the horn of a cow. If the horn is still attached to the cow, the husband must give the wife the whole cow. Board of Inland Revenue v. Haddock was dramatized for BBC television as “The Negotiable Cow” as the opening of the first series of A. P. Herbert’s Misleading Cases in 1967, with Roy Dotrice as Albert Haddock and Alastair Sim as Mr Justice Swallow. The BBC did not keep tapes of all its shows in those days but there are audio recordings of some and snippets available on YouTube. In light of Herbert’s protagonist’s name, a dish of haddock is the order of the day I feel. I enjoy a fillet of smoked haddock for breakfast, poached and served with a buttered crusty roll. Haddock and chips also used to be a favorite of mine when I frequented chippies. Baked haddock is also a simple and satisfying dish. This is a classic English recipe. Preheat the oven to 350˚F. Lightly grease a large shallow baking dish. Pat the haddock dry and arrange it in the prepared baking dish. Sprinkle with salt and pepper to taste. In a small bowl, mix together the melted butter, lemon juice and minced garlic. Evenly brush the seasoned butter over the haddock fillets, then sprinkle the fillets with parsley, tarragon, and paprika. Bake at 350 for 25-35 minutes or until it is opaque and flakes easily. 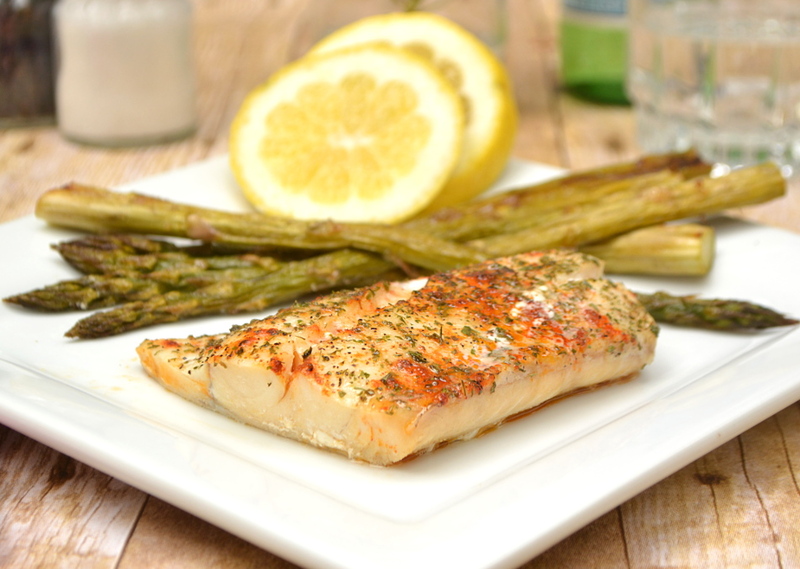 Serve with poached asparagus or fresh green peas, (and lemon wedges if you like).